In Running Reports in SoGoSurvey: Part 1, we started with a basic Bar Graph Report to show you how to generate reports in SoGoSurvey. Now we’re ready to go a little deeper and look at some of the other popular reports for analyzing survey results. The Conditional Report is a great next step for digging deeper into the data and understanding what different groups think. For example, you could set the condition to only display results from male participants. Select the question from the drop down that you want to use to create your condition (e.g., what is your gender?). Select the condition (Is or Is Not) and select the answer that will serve as your condition (e.g., Male). If you like, you can keep adding conditions to further segment your data. Another popular report is the Individual Report, which shows how each person responded to all or selected questions in your survey. From this report, you can edit responses in case someone accidentally gave the wrong response, for example, their office location. You can also delete responses if someone took your survey and should not have. Another report our users find helpful is the Verbatim Report. The report allows you to see all the open-ended (text) responses in a readable format. This makes it easy to identify common themes among open-ended responses. For example, you could export the report to Excel and sort responses in random order. Then take a percentage of those responses to look for themes (e.g., for 1,000 responses, analyze 10% or 100 responses). Then set criteria for considering something a theme, such as having at least 10 similar responses. To view an individual’s responses to the entire survey, click on the survey number next to their response. For example, if someone responded negatively in an open-ended question, you may want to see the rest of their responses. The Response Table allows you to view how each participant answered each question in a neat table format. 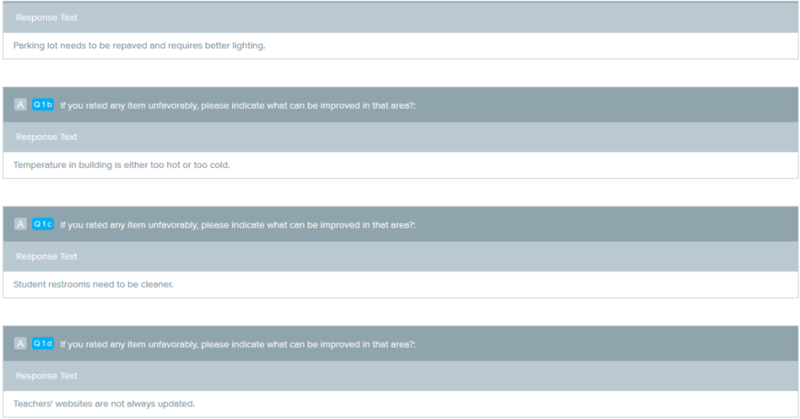 You can also select the survey number in the first column to edit or delete responses. Come back for Part 3, where we’ll talk about using the Filter Manager, as well as some of the more advanced reports.